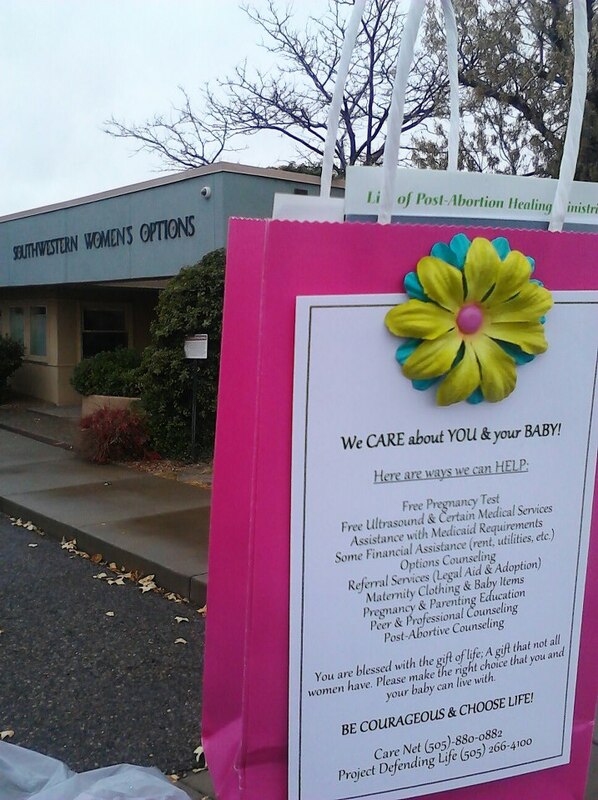 As women leave the late-term abortion clinic, Southwestern Women’s Options, in Albuquerque, New Mexico, I ask them to tell the driver of a van that transports the women back and forth from their hotel to stop so they can receive a gift bag (or “Grace in a Bag”). The bag contains information for the women to consider both before and after their abortion and it also contains a gift for them (manicure kit, tissues, and cozy socks for her). This particular day, the driver did stop, but not to take information per the woman’s request, but to curse me out and yell at me. It struck me that abortion has a butterfly effect which impacts far more people than simply the child and the mother. The chaos that is created when a woman makes the choice to have an abortion leaves many destroyed lives in the wake. If you consider that since the “Roe vs. Wade” ruling in 1973 there have been an estimated 55,000,000 children’s lives forever destroyed. Let’s add 55,000,000 mothers, 55,000,000 fathers, 55,000,000 grandmothers, 55,000,000 grandfathers, 55,000,000 siblings, aunts, uncles, and as it struck me today drivers and friends…these individuals alone total 550,000,000! Abortion is the hurricane that is ravaging not just children and women, but our entire nation! The butterfly effect of abortion may be impossible to quantify. 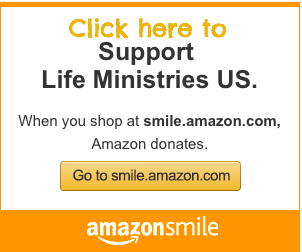 However, if you step out in faith and compassionately strive to end even just one abortion, there is hope for the alternative best articulated by the following Jewish saying, “When you save one life it is as if you saved the entire world.” We all have the ability and the responsibility to put a stop to all this chaos! That is why it is so vitally important to take a stand for life today. We often simply think about the woman and her choice to have an abortion. However, we all have a choice to make as we are confronted with and impacted by abortion. That driver of the van made a choice and contributed to the chaos. My prayer is that more people will choose to allow God to use them to calm this raging storm and end abortion one child, one woman, one day at a time! 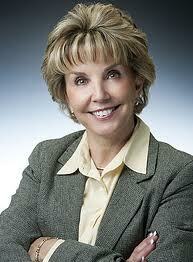 Albuquerque NM- The day after the New Mexico Medical Board ruled to dismiss charges against late term abortionist Shelley Sella, the next item of business on the agenda was to create a task force to amend Board Regulations on Complaint Procedures. This is a direct attempt by a radically motivated pro-abortion Medical Board to prevent future investigations into the practices of unregulated abortionists in the state. Since 2010 the New Mexico Medical Board has done nothing less than try to cover for Albuquerque abortionists who are injuring women at staggering rate. Tara Shaver of Project Defending Life filed medical board complaints against abortionists at both Southwestern Women’s Options and UNM Center for Reproductive Health abortion clinics after documenting 14 abortion injuries through a public records request. Lynn Hart, Executive Director of the NMMB immediately met these complaints with resistance based on the complaint filer being Pro-Life, instead of the merit of the complaint. Just last month a medical board complaint that was filed against Shauna Jamison and Richard Adams by Tara Shaver, was returned in its original form with a letter stating the Board’s refusal to investigate. Their reasons for refusal were that Tara Shaver did not know the patient and that the board doesn’t investigate based on malpractice suits. This is a bit inconsistent since the Board already has mandatory access to all malpractice actions against providers under their jurisdiction. See NMCA 16.10.10.8. To have the patient file a complaint would be redundant. Planned Parenthood abortionists, Jamison and Adams, perforated a woman’s bowel during a tubal ligation in May 2011, and then a mere seven months later the woman became pregnant. This woman is currently suing Jamison and Adams for medical negligence, yet the Board is refusing to investigate this preventable injury simply because up to that point the patient had not filed a complaint on her own accord. The NMMB was created by statute “[i]n the interest of public health, safety and welfare and to protect the public from the improper, unprofessional, incompetent and unlawful practice of medicine.” NMSA 1978 §61-6-1 (emphasis added). The Board is not a haven for injured or unhappy patients; it exists to protect the public (and not individual patients) from incompetent, unprofessional, or unethical health care providers to limit the Board’s investigative powers to only those complaints filed by patients. The refusal to investigate abortionists is a deliberate attempt by the Board to shirk its duty and is an administrative undermining of the duty entrusted to it by the legislature – to protect the public. The boards prejudice is based on the never ending pro-abortion mentality that has engulfed this state. The danger facing the women of New Mexico is being deliberately ignored by public safety agencies in a concentrated effort to prevent any regulation of abortion. All of this effort is a direct way for the New Mexico Medical Board to prevent investigations of abortionists who they believe are above regulation. The New Mexico Medical Board made a ruling today that places the safety of women in New Mexico at risk by dismissing the case against late-term abortionist Shelley Sella without discipline after she botched a 35-week abortion that resulted in a ruptured uterus and the inability of her patient to bear future children. Sella’s lawyer recused one of the Pro-Life Doctor’s who was on the Board and two other Pro-Life Doctor’s recused themselves! Today I am thankful for the process that led up to this decision. It is so incredibly important for the public to know that there is a system in place that addresses concerns that arise from the medical community. All I have asked from the medical board from the beginning was to be objective and to investigate all of the facts in this case. I am disappointed but not surprised by this decision due to the fact that there is no standard of care currently in New Mexico for abortion clinics. It is evident from the recent medical board hearing testimony that abortionists make up the rules as they go and set their own standards. 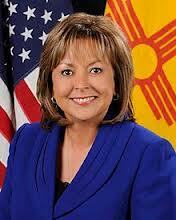 Women deserve better than the substandard care they are currently receiving inside of NM abortion clinics. 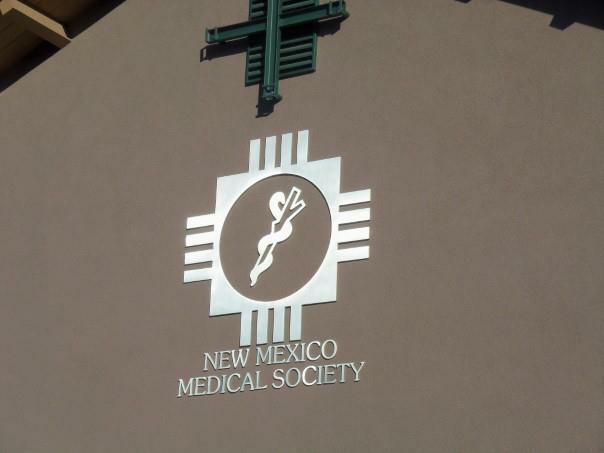 While the NMMB only has jurisdiction over the licensure of Medical Doctor’s and Physician Assistant’s this hearing has brought out the fact that late term abortionists in Albuquerque are violating the NM criminal abortion statute (NMSA 1978 § 30-5-3). This statute states that the practice of late term abortion outside of an accredited hospital is illegal. Violating this statute leads to the types of injuries the woman in this case endured. The women of NM are calling on District Attorney Brandenburg to enforce this statute in order to protect them from potentially life threatening abortion complications. This statute must be enforced to ensure that dangerous 3rd trimester abortions will not continue to be obtained outside of a hospital setting. These facts would have never been brought to light apart from this medical board investigation. Respectfully ask her to enforce NMSA 1978 § 30-5-3, the criminal abortion statute requiring late term procedures to be performed in hospitals.